Symphony Scorecard already changes lives. It’s about to change even more. One of the Grand Rapids Symphony’s latest initiatives, Symphony Scorecard opens doors to new audiences, particularly those who would like to attend concerts but are unable due to financial constraints. Now, the Grand Rapids Art Museum is joining the effort to expand access to arts and culture. Created two years ago by the Grand Rapids Symphony, Symphony Scorecard provides free tickets to concerts to members of the community who receive financial assistance from the State of Michigan as well as to those currently are serving in the U.S. Military. Since September 2015, Scorecard members have been eligible to receive up to four free tickets for most Grand Rapids Symphony concerts aside from some special events. Not four tickets per season, up to four tickets per available concert. As Symphony Scorecard enters its third year, Grand Rapids Art Museum is partnering to offer free admission to the art museum to participants. “The museum is committed to expanding inclusive and accessible opportunities for visitors year-round, and this partnership offers unprecedented access to the visual and performing arts in West Michigan,” said Dale Friis-Hansen, Museum Director and CEO. Funded by a major gift from the Daniel and Pamella DeVos Foundation, Symphony Scorecard has been a success from its start. Its initial goal was to distribute 400 tickets in its first season. But the response, was so overwhelming that by the end of the 2015-16 concert season, more than 2,000 tickets were provided to residents of Kent, Ottawa and Muskegon counties. The following year, another 3,000 tickets were given, and the Grand Rapids Symphony anticipates providing even more during its 2017-18 concert season opening on Friday and Saturday, Sept. 15, in DeVos Performance Hall. 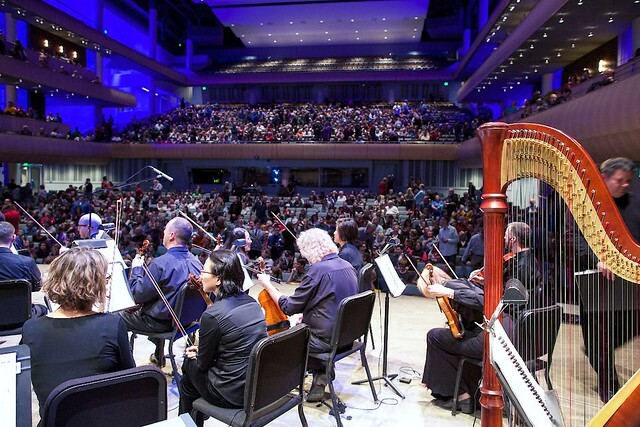 “Grand Rapids Symphony’s Symphony Scorecard gives participants an opportunity to lift their spirts through music while sharing the live experience with others,” said Grand Rapids Symphony President Peter Perez. For Scorecard participants such as Artie Smith, who attended her first symphony concert in 50 years at age 82, it was a life-changing experience. Barbara Neumann, a resident of Mount Mercy Apartments in Grand Rapids, says she has attended many Grand Rapids Symphony concerts and has encouraged several friends living in the community for older and disabled adults to join her. She says they almost always have the same reaction. Myra Lilly-Gillespie, a resident at Ransom Towers in downtown Grand Rapids, was a friend who was invited by another Scorecard member to join. Soon, Lilly-Gillespie brought along a guest of her own. Residents in adult foster care and in group homes are especially enthusiastic about the experience, according to Colene Johnson, Community Resource Coordinator with the Michigan Department of Health and Human Services, which determines eligibility to participate in Symphony Scorecard. The Grand Rapids Art Museum’s 2017-18 calendar of exhibitions offers a dynamic lineup of art experiences for Symphony Scorecard participants. Upcoming exhibitions include Andy Warhol’s American Icons; Christian Marclay: Video Quartet; Alexis Rockman: The Great Lakes Cycle; and Who Shot Sports: A Photographic History from 1843 – Present. Scorecard members additionally may participate in a wide variety of programing and events at GRAM, including Artist and Curator lectures; Drop-in Studio, Artist Drop-in Tours, and Baby & Me Tours; and Yoga at GRAM, and the Sunday Classical Concert Series. Though limited resources may be less of an issue for members of the U.S. Armed Forces, a greater concern for servicemen and women is family life when a member is deployed. When a family member is away for months, it’s important that they have support at home. Sharing arts and cultural experiences with others is a comfort in emotionally trying times. Scorecard offers a helping hand, said Gunnery Sgt. Teodulfo Nunez of the U.S. Marine Corps Recruiting Office in Grand Rapids.